As evidenced by yesterday’s Super Bowl trailer, Marvel is seriously bringing the girl power when it comes to Captain Marvel, the studio’s first woman-led superhero film. Marvel’s marketing campaign may go out of its way to target female moviegoers, but as recently as a few months ago, it was shockingly difficult to find Captain Marvel-themed geek fashion tailored to women. Fortunately, as the film’s March 8 release draws closer, that appears to be changing. Since Carol is famously an Air Force fighter pilot, it’s only fitting Hero Within’s new design is a flight jacket. It’s a bright, gorgeous navy blue with a “C. Danvers” patch on the front, Carol’s signature star logo embroidered across the back, and a sublimated lining. Perhaps our favorite feature — ladies, rejoice! — is the generous amount of pockets. The Captain Marvel Flight Jacket features a total of eight interior and exterior pockets for storing a cellphone, keys, lip gloss, and maybe some Flerken kitty treats. The jacket is currently available for preorder. After that number is filled, they’ll sell at retail price. You can find more details here. Below, you’ll find a Q&A with Tony B. Kim, Hero Within founder and CEO, detailing the inspirations and design process behind the Captain Marvel Flight Jacket, and his thoughts about Marvel’s upcoming film. A flight jacket is a natural fit for Carol Danvers. Tell me about the process of designing this jacket and the inspirations behind the design. I am so excited for this film because it’s the first female-led Marvel film. I love that the character of Carol Danvers is a pilot. I think, culturally, there are so many parallels with the idea of women taking flight. As we have seen in various recent movements, it’s time for women to break through the glass ceilings that have been imposed since the beginning of time. So when we designed this jacket, we felt a flight jacket would be the perfect embodiment of that sentiment. Our vision is that our styles would bring a sense of empowerment to the wearer — and I think this accomplishes that. There’s a lot of buzz surrounding the Captain Marvel movie, which is due in theaters March 8. What’s the response been like so far to this design? Very strong. I can tell that this movie and character is something female fans have been wanting for a long time. It’s certainly been evident in our preorder launch. In just a few days, the response has been tremendous. There has been a lot of support on our website and on social media. Typical to Hero Within, our design for this jacket is subtle, which our fans seem to like. I have to say it’s refreshing that you designed this jacket for women. There are still a surprising amount of Captain Marvel apparel items that are just for men. There was no question that we would design this in a ladies cut. In the rest of our collection, we’ve had many women buy the men’s sizing and just deal with the proportions, so we wanted to make sure this jacket was designed with them in mind. However, just because it’s designed for ladies, doesn’t not mean it’s exclusively a women’s only jacket. Men are also interested and buying it. A guy size Small could wear the Large or XL. Captain Marvel is not just a hero for one gender but for everyone! I was also thrilled to see a plus model featured in your marketing campaign for this jacket. That’s a big step for your company in terms of inclusiveness. Why did you decide to go that route? Yes, that was certainly intentional. Our fan base from the start have been of customers of all shapes and sizes. With the marketing for this piece, we wanted to reflect that. We’ve already noticed a significant amount of our plus sizes have been pre-ordered. It’s an obvious need out there and we are happy to embrace and empower all of our fans. Our model Samantha is a huge fan of Marvel and was thrilled to be a part of this shoot. Can you tell me a little about the aviation-themed photo shoot you did for the campaign? We shot the Captain Marvel photos at the Lyon Air Museum in Orange County. To me, nothing captures the idea of going higher, further, and faster than the World War II-era fighter planes. At that time, air transportation was nowhere near advanced as it was today — certainly not combat aircraft. So there was a real sense of inherent risk those pilots accepted every time they went up in the air. Called the greatest generation, those pilots sacrificed their lives to bring hope, freedom, and a future for us — so it seemed perfect thematically with our Captain Marvel Flight Jacket. Another exciting thing about this jacket is the sheer number of pockets it has. Every time I put on my Hero Within Wonder Woman denim jacket, I have to just stop for a moment and appreciate its inner pockets. This is a big deal for women. I’m assuming this was intentional on your part? Pockets are life! Absolutely. There are four interior and four exterior pockets. This has been the signature design element of Hero Within. You can’t expect a hero to save the world without room for their phone, charger, lipstick, etc. We get tons of feedback from our fans that they are so appreciative of this and we will continue to include pockets in every future piece we do. 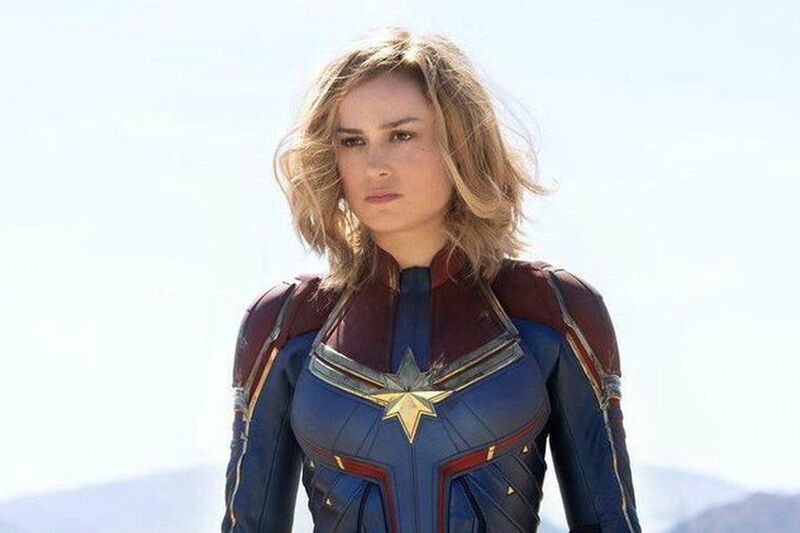 Do you have any thoughts about the Captain Marvel movie or the role she may play in Avengers: Endgame? I think Carol Danvers will continue to break the cultural norms for the Marvel Universe. Sure we’ve made a lot of progress but, still, in Avengers: Infinity War, the men were the primary heroes and the women were somewhat the “victims.” I think Captain Marvel will change that — and no doubt some male fans will have a problem with that. I hope that this film pushes the needle of change and create new conversations of enlightenment for fandom. I also hope that Hero Within can play a small part in that through fashion. To have the privilege to bring empowerment to our fans is a sacred thing to me. This is more than selling jackets or making money; it’s about bringing pride and power to a community that I love dearly. I believe 2019 is going to be an awesome year for us all! This entry was tagged Avengers Infinity War, Avengers: Endgame, aviation, Captain Marvel, Carol Danvers, flight jacket, geek fashion, Hero Within, Marvel, outerwear, pilot, plus model, plus size, pockets. Bookmark the permalink. Fantastic jacket! I love the line about “bringing pride and power to a community “. Let’s just hope Captain Marvel lives up to this motto!